The first post-AGM FoBCA committee meeting was held, and your new FoBCA committee was established to serve for the next financial year. With the exception of Roy Fuller-Gee, most of the previous committee members carried over their current portfolios. Our long-standing chairman has finally chosen to step down as chairman in order to focus on other areas of conservation. Stephanie Muller, whom many of you have met on walks, has been elected as chairwoman in Roy's place. • The AGM of the Friends of BCA was held on Sat 26 May 2018. Attendees heartily greeted each other, taking their coffee and rusks in the wonderfully warm winter sunshine prior to the meeting. Rob Slater from WESSA gave an excellent talk on the Green Coast initiative, what it entails and what will be required from responsible parties in order to retain this status. The Blaauwberg beach within the BBNR is the first pilot site in South Africa. Big Bay beach, Bloubergstrand lost its Blue Flag status a while ago, and it is imperative that we succeed with this initiative. ~ The WESSA BFG (‘Big Friends Group’) event that we advertised in our last newsletter, was held on Saturday, 17 February, and well attended by FoBCA members. Below is an overview of the event that appeared in the Argus 26 February. It was a great opportunity to meet members of all the different Friends groups across the Peninsula, all with a common purpose – to protect and conserve. The speakers were all well received. Get your hands on a copy of Cormac Cullinan's book "Wild Law" - it's highly recommended reading. The next BFG will be held on Saturday, 4 August – please diarise it so that you can be sure not to miss out on this very informative and entertaining social event. The year started off with a bang, and a puff of smoke! 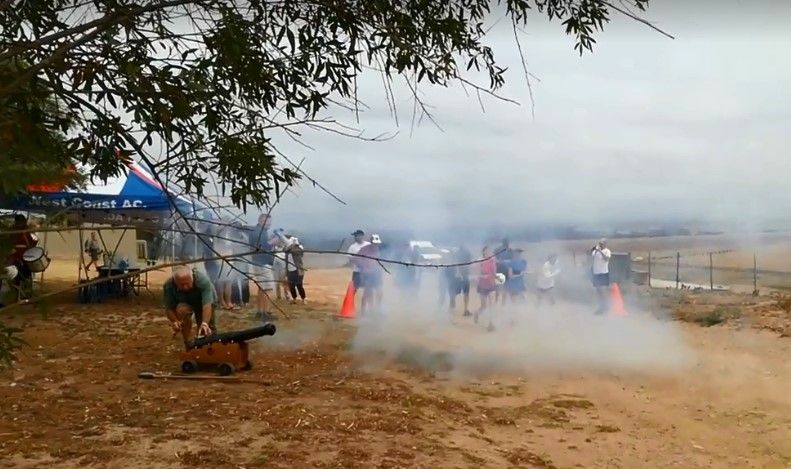 For the second time since the 210th anniversary of the Battle of Blaauwberg 1806, in collaboration with the local staff of the Blaauwberg Nature Reserve and with the kind permission and hospitality of the owners of Blaauwberg Farm, the Friends hosted a commemorative event on Saturday, 6th January 2018 at the Blaauwberg Farm. Read more about it under Special Events. 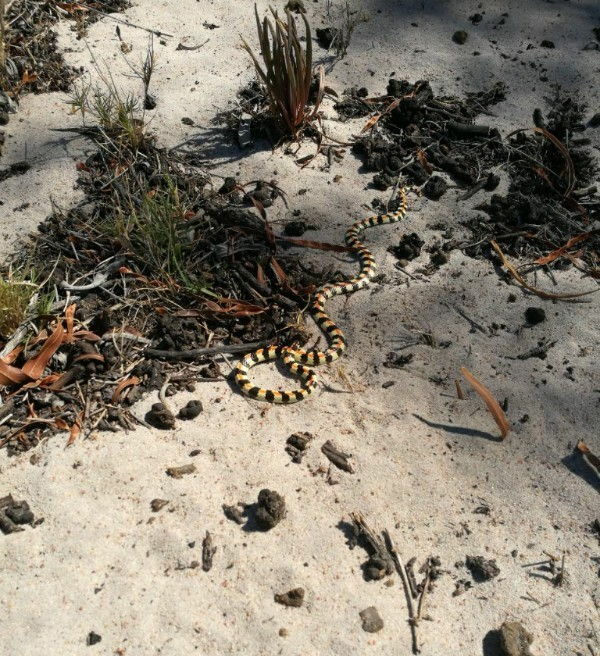 This beautiful specimen was seen during a recent Archaeology Survey being done in the Blaauwberg Nature Reserve. Nobody was prepared to put their pinkie next to it for size reference! On 16 Dec 2017, the FoBCA held its year-end function at Eerste Steen Resort, where Friends gathered to enjoy having their olfactory senses stimulated by the aromas from the braais wafting on the "gentle" Southeaster breeze. The occasion was marked by the launching of the newly published 2nd edition of the Coastal Walk Flower Guide. 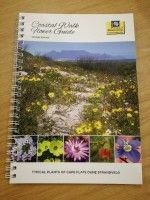 This guide is for the novice to easily identify flora according to its colour on the Coastal Dune Trail in the Blaauwberg Nature Reserve (the 4.5km loop trail that starts opposite Eerste Steen Resort - map inside cover) and can be used on many other walking routes that have Cape Flats Dune Strandveld vegetation along the West Coast. It contains beautifully clear colour photographs of approximately half the species recorded on the Dune Trail itself. Here and there throughout the guide are little extra fun facts and at the back is a Quick Guide to the flowering months of each species.